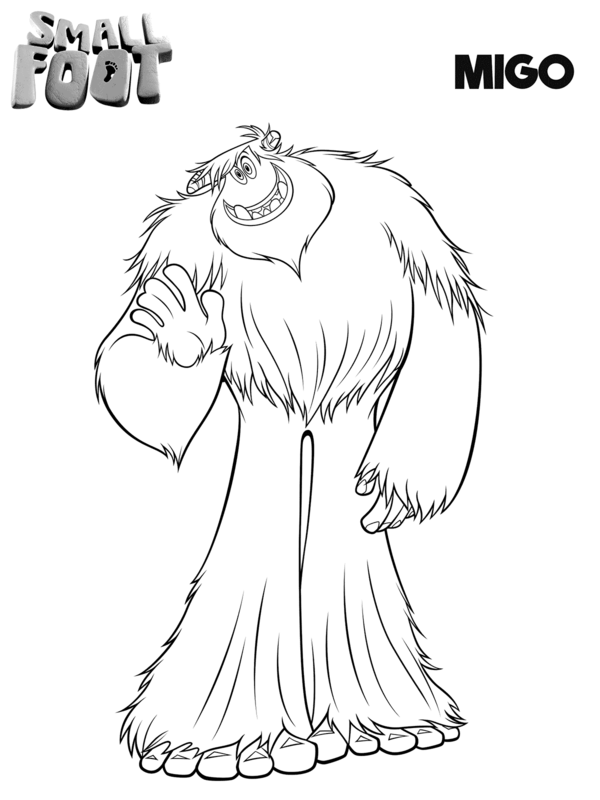 Hello friends, today we’ve got you coloring pages of latest animated film- free printable Smallfoot coloring pages. “Smallfoot”, an animated film produced by Warner Brothers, busts a myth when a young yeti comes across a human being, something that he never thought existed. The news of this human being named Percy spreads across the yeti community, causing a major uproar in the snowy village. What follows is a heart rendering story about courage, friendship, and of course, the joy of discovering ‘smallfoot’. The movie “Smallfoot” stars Channing Tatum as the lead yeti, named Migo and James Corden (from Trolls) as Percy, the Smallfoot. The cast also includes LeBron James (yes, the famous basketball player), Danny DeVito and Zendaya. Let’s check out the small, but adorable free Smallfoot coloring sheets below! 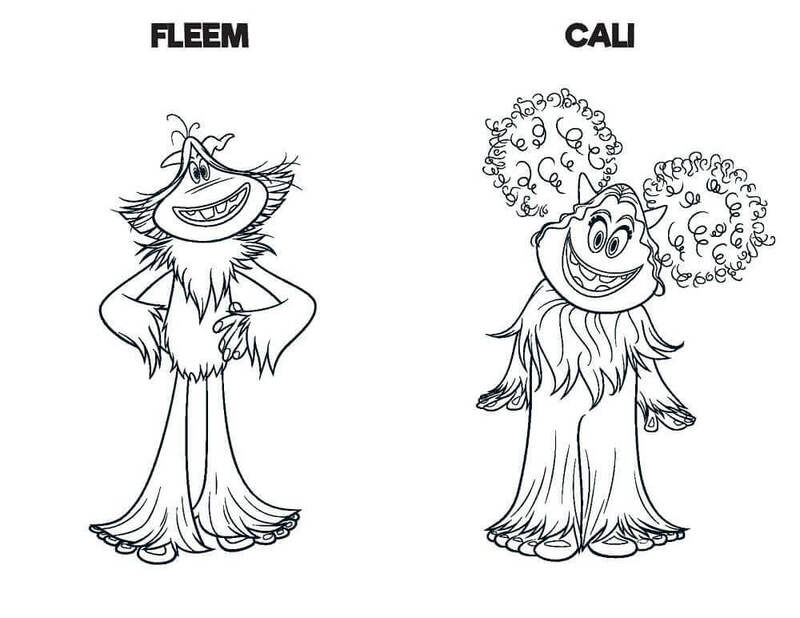 Here’s a coloring sheet of Fleem and Cali from “Smallfoot”. Not much is revealed about both the characters, but since they’ve been included in the activity sheet pack, we believe they’ll play an integral role in the movie. We’ll find that out when the movie releases. 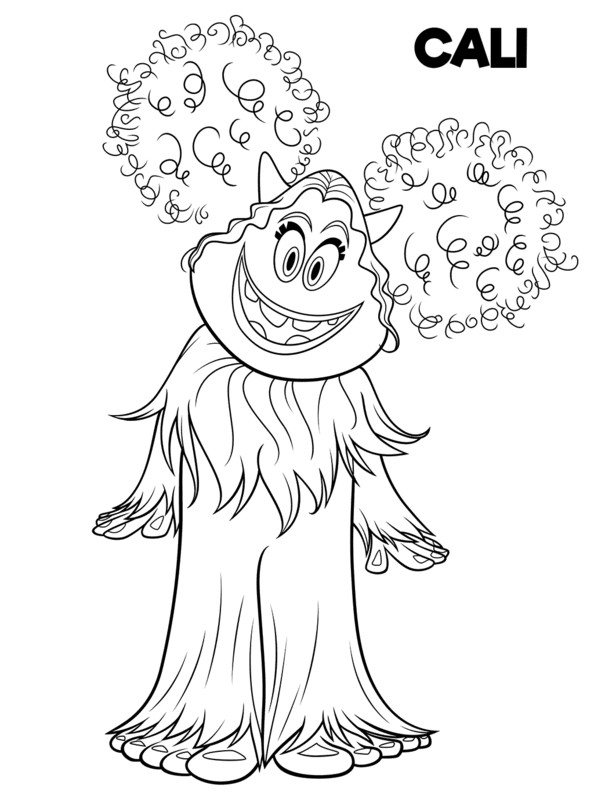 Here’s a coloring sheet of adorable and lovable, Kolka, an important character from the movie. Unlike the other yetis, who are terrifying to look, Kolka has a pleasing personality. She has an off-white body covered with furs and blue lips, palms, toes, and horns. Meet Cali, one of the most important characters in the movie Smallfoot. Like we told you, nothing much is revealed about this character, but going by the looks, she looks like a happy-go-lucky character. Her hair, especially, is the highlight of her appearance. 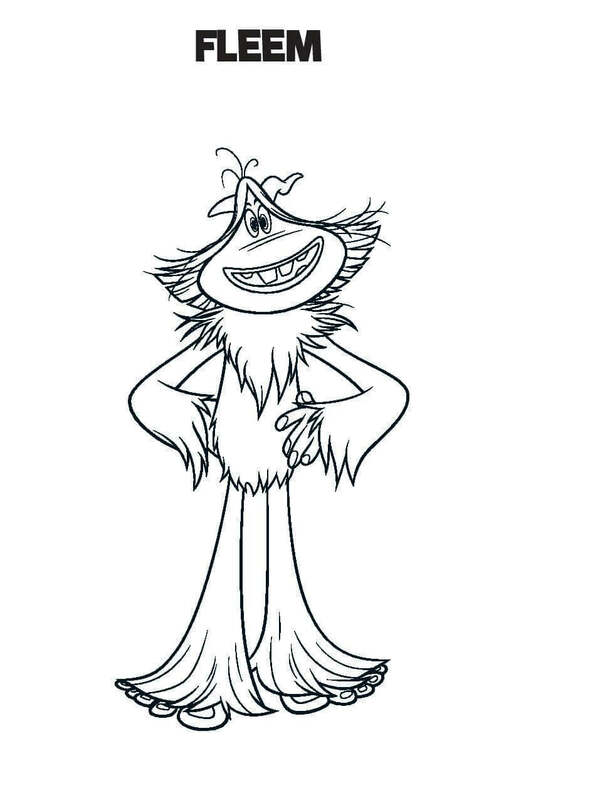 Here’s a coloring sheet of Migo, the protagonist of Smallfoot, who discovers Percy, a human being he wasn’t supposed to know of, in the mountains. Voiced by Channing Tatum, Migo has long legs, a stealthy body and a heart as big as his blue feet. So color him in a way that captures his charm. 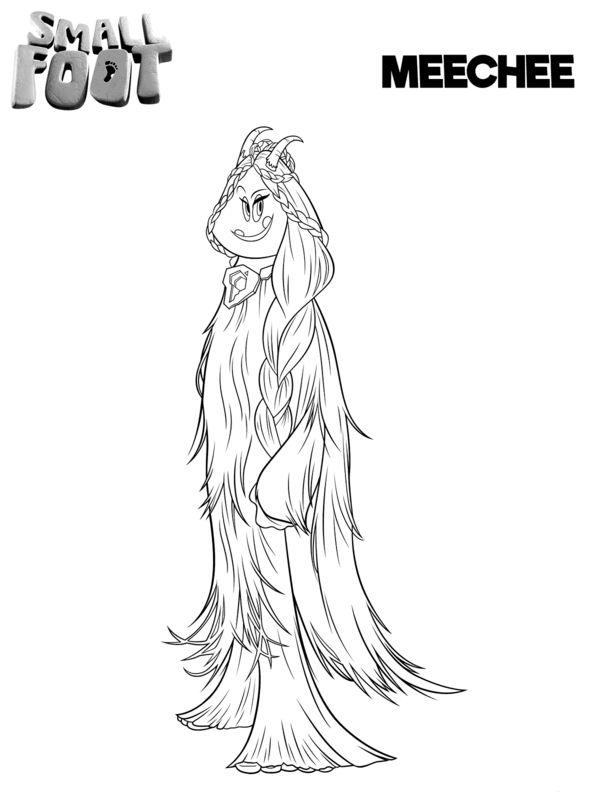 This coloring sheet features Meechee, the beautiful daughter of the Stonekeeper. Since she is the daughter of one of the most revered yeti, she is expected to follow all the rules, but she finds hard to abide as she cannot help thinking about the bigger world outside. Meet, one of the yetis from the movie, “Smallfoot”. In this coloring sheet, Fleem appears like a clumsy character. But who knows, he might be an intelligent fellow. After all, we shouldn’t judge people on the basis of their appearance. Here’s a coloring sheet of Gwangi, the firm believer of Smallfoots. Gwangi doesn’t just believe in Smallfoots, but a lot of other things as well. You can say he’s a conspiracy theorist, who feels that everything has secrets and there are mysterious forces controlling the lives of yeti. 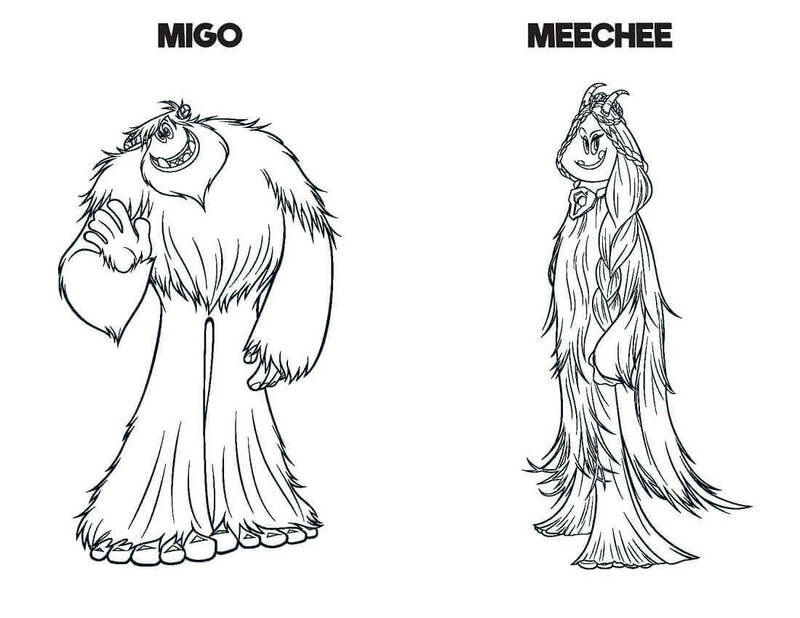 Here’s a coloring sheet of the most adorable pair of the film, Migo and Meechee. Both Migo and Meechee are curious souls and love to ask questions, even though it annoys the elders. While Migo was raised to believe that Smallfoots do not exist and he even believes this philosophy to an extent, Meechee feels that they do exist and even hope to find them one day. 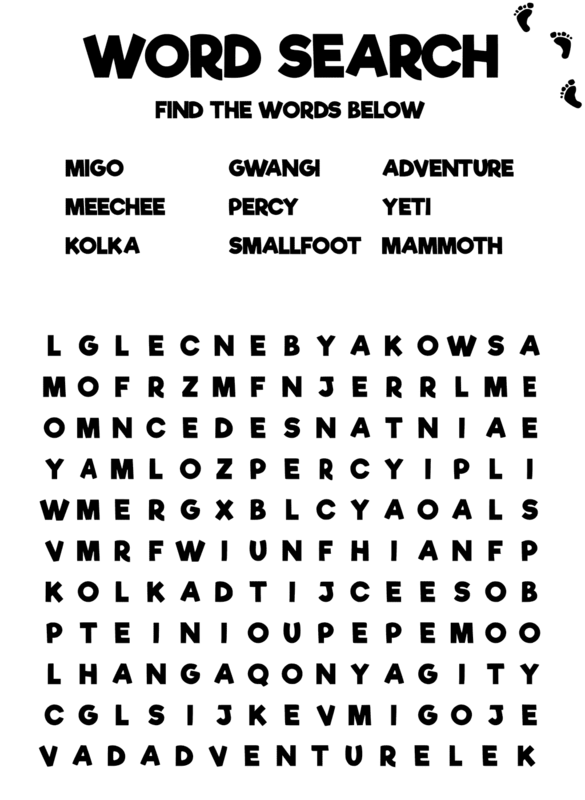 Here’s a fun word search activity sheet from the movie “Smallfoot” for our preschooler readers. There is a list of words given, which the kids have to find on the activity sheet. We think it’s a great way to unwind after watching the movie. 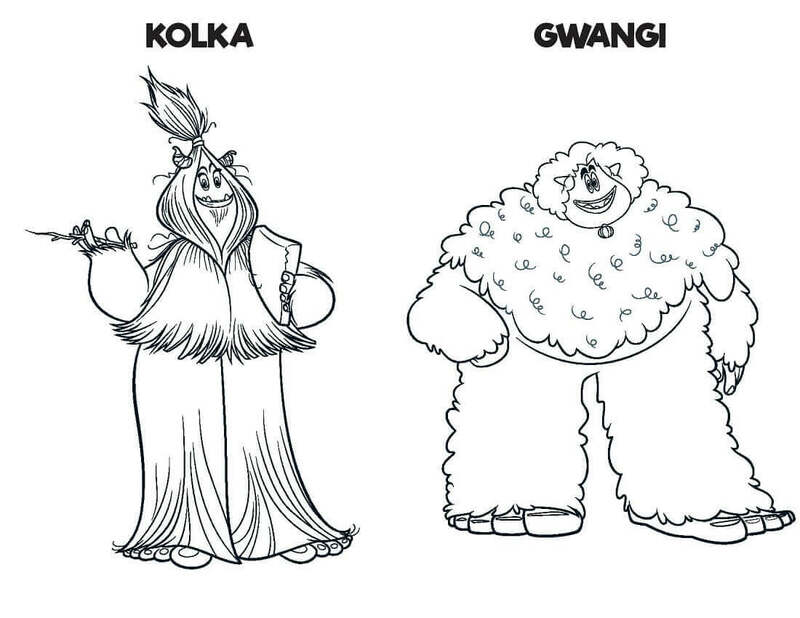 This Smallfoot coloring sheet features Gwangi and Kolka. While Gwangi is a conspiracy theorist who feels that something wrong is going in the village, Kolka is a science nerd in the truest sense. In fact, her all-time favorite subject is human, the majestic and elusive creature, which the yetis refer to as Smallfoot. So these were the best free Smallfoot coloring pictures to print. We’d love to know your views on the movie and also these Smallfoot coloring images. So do let us know about the same. Until then, keep coloring.